If you're a collector with a love of rare antique furniture, then keep an eye out for this auction which is taking place in Boston US on March 4. Online bidding is also available. Among the sale's highlights is this authentic Queen Anne fan-carved walnut and maple high chest of drawers, with a scroll-top. The historic piece of furniture is believed to possibly originate in Salem, Massachusetts. It has been dated to circa 1740-60. 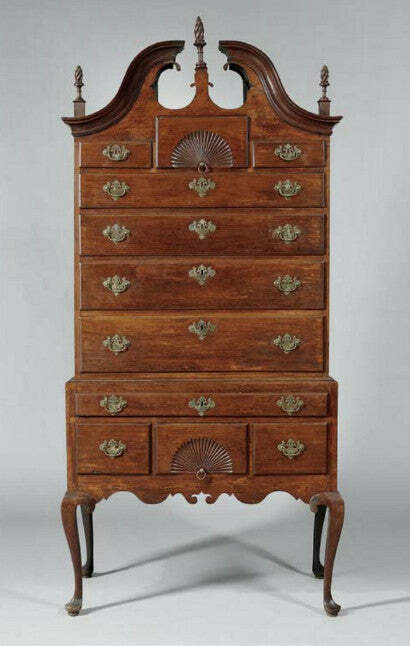 Notice the high chest of drawers' design on its upper section. It depicts a swan's neck cresting beside a scroll cutout. Meanwhile, three flame-carved and turned finials are set into the furniture piece's lower section. This design feature includes a valanced apron alongside the chest's original brasses. This high chest of drawers is 88 ¾ inches in height. It is expected to sell between $10,000 and $15,000 when in auctions in Boston, next month. Antique American furniture pieces can command huge sums at auction. Last month, a final bid of $317,200 in another US auction set a new World Record price for a veneered William and Mary high chest of drawers. Watch this space for more news from the rare collectible antique furniture markets.